And these crazy people are supposed to be lawyers and representing people in the future. Prior to “hundreds of alumni” writing a letter demanding Supreme Court nominee Brett Kavanaugh be disallowed from teaching at Harvard University, undergraduates who opposed the judge had made formal complaints through the school’s Title IX office that his very presence amounted to sexual harassment. The Harvard Crimson reports that student Jacqueline L. Kellogg, a senior, came up with the idea a few days ago and recruited others to join her in filing complaints against Kavanaugh. Kellogg even sent a letter detailing specifically how to file a formal complaint with Harvard’s Office for Dispute Resolution. 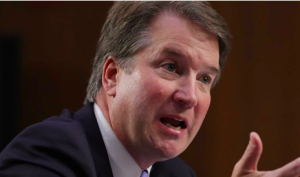 Kellogg and fellow student Julia B. Wiener, also a senior, filed complaints claiming Kavanaugh’s presence on campus would create a “hostile environment” for women because of the uncorroborated and thin sexual assault allegations against him.